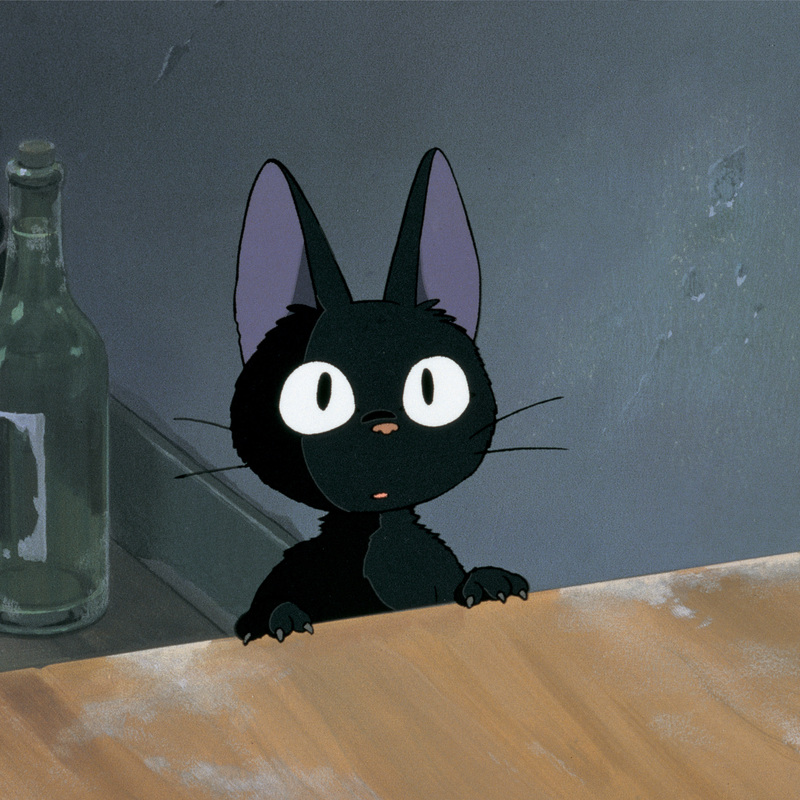 Deceptively simple and sweet, Hayao Miyazaki’s Kiki’s Delivery Service has still managed to linger in the hearts of movie lovers, and now it’s finally gotten the proper DVD treatment it deserves from Disney and Studio Ghibli. Kiki, voiced by a young Kirsten Dunst in this Western version of the story, is a 13-year-old witch who – as is the custom – is sent to live away from her parents for a year to figure out what her talent is. 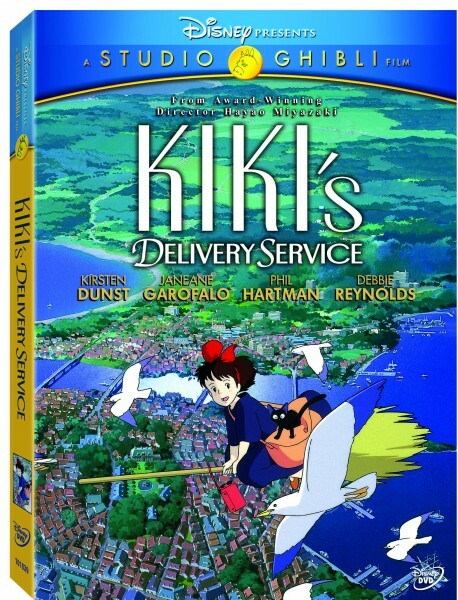 Kiki eventually settles on Koriko, which resembles a seaside European village in the 1950s, and sets up her titular delivery service. Hit the jump to find out why I still think the first Ghibli/Disney collaboration is the best one, and what kind of extras make this special edition worth buying. 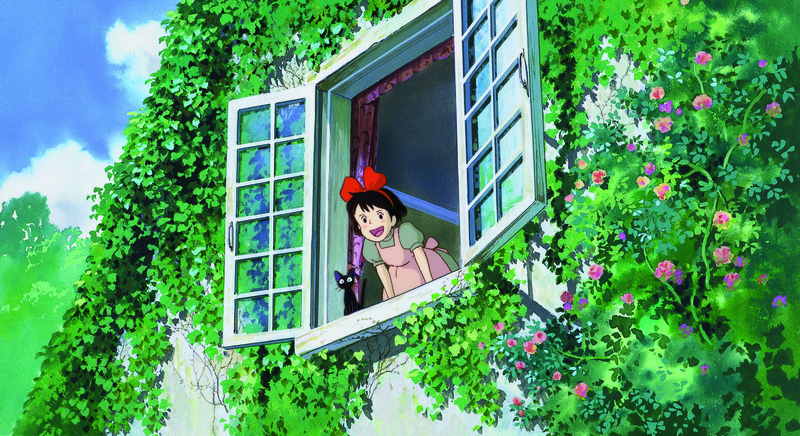 One of the things that makes viewers of all ages become instantly engaged with Kiki’s story is the genuine wonder with which she approaches the world, delivered in both Miyazaki’s story (loosely based on the novel by Eiko Kadono) and in Dunst’s voice work. He’s said in interviews that he modeled Kiki’s adventures on the mix of independence and reliance experienced by Japanese girls, and as he did for younger children with My Neighbor Totoro and later Ponyo, he’s made a story that fits his heroine’s age and outlook perfectly. And it doesn’t hurt that visually this is probably Miyazaki’s best work too, and certainly his most mainstream. John Lasseter, who introduces the movie on DVD, is known to be a devoted fan, and you can see the direct link from the stunning sight of Kiki encountering her new seaside home for the first time and when Remy scurries to the rooftop and gets his first glimpse of Paris. Oh if only Pixar hadn’t caught the 3-D bug … oops, I won’t digress. 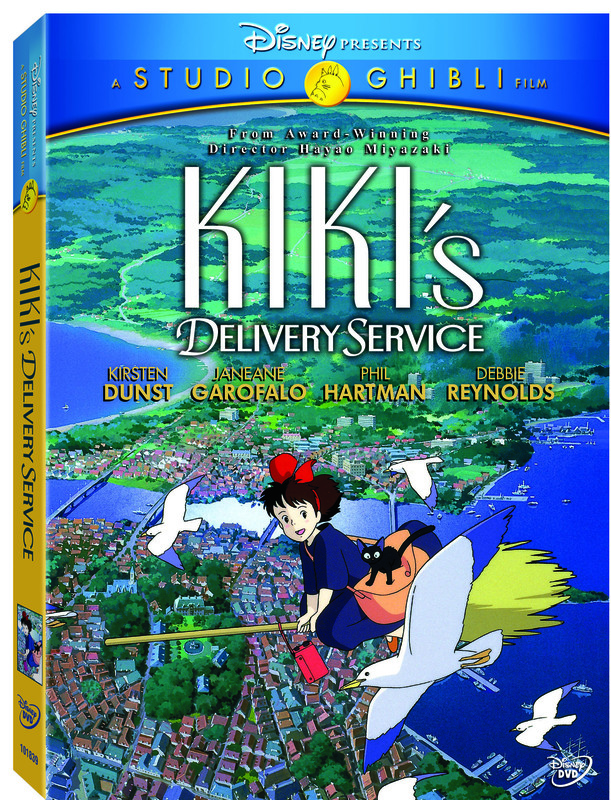 As Kiki settles in Koriko and discovers what she can do with her talent for flying, she’s always accompanied by her loyal sidekick, a black cat named Jiji, voiced in the Western version by the late Phil Hartman. Though he was never one of my favorite Saturday Night Live performers, he’s restrained but seriously sarcastic here, and it’s what I most like to remember him for. 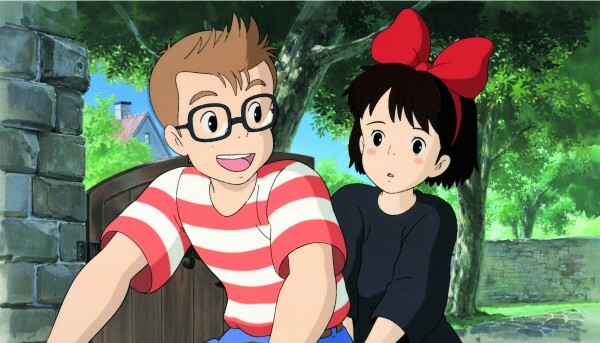 Kiki also finds her first love in Tombo, a young boy who looks surely not coincidentally a heck of a lot like TinTin. 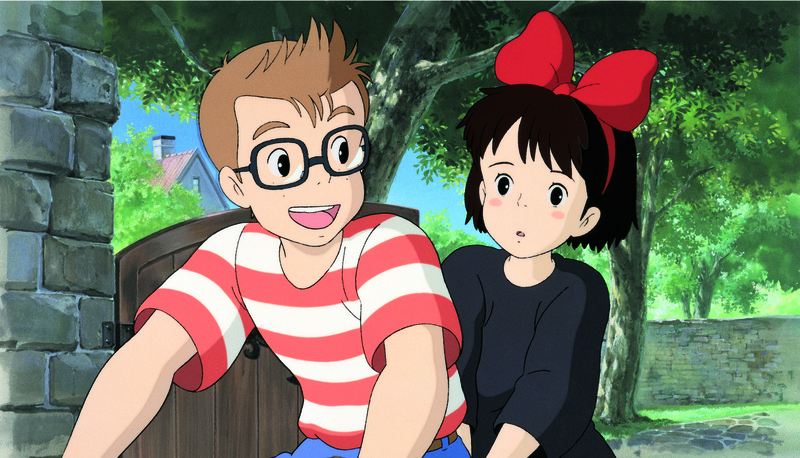 Like Miyazaki himself, Tombo has a love of flying machines, and it’s this signature Miyazaki trait that give’s Kiki’s Delivery Service its strongest act – the big finale. The movie ambles along at a leisurely and breezy pace until Kiki starts to lose her two most valuable skills, flying and the ability to talk to Jiji. I don’t want to give too much away, but she eventually gets them back with the help of a mysterious hippie artist named Ursula (Janeane Garofalo, yes really), just in time to come to the rescue of poor Tombo, who finds himself – among other things – hanging on to a rope attached to a crashed dirigible. 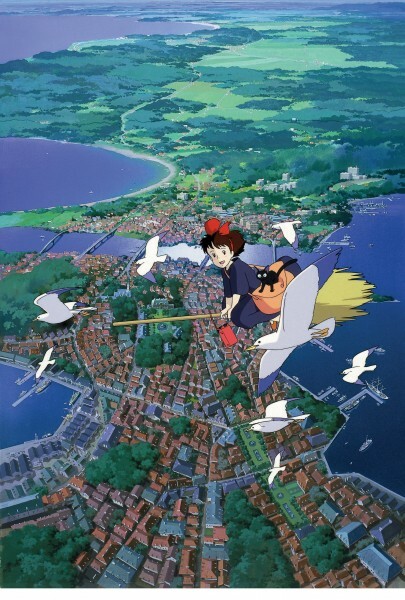 It’s a super action set piece that’s rivaled in Miyazaki’s work only by the finale of Castle in the Sky, and it’s what seals the timeless quality of Kiki’s Delivery Service. In the extras, Miyazaki makes a sly dig at Western audiences who don’t stick around through the credits (unlike Japanese audiences who, not surprisingly, apparently sit there dutifully until the lights come up), and there is indeed plenty of reason to stick around until the very end of Kiki’s credits (which I admittedly didn’t do until now.) It completes the story in a humorous and touching way, and just sums it up perfectly. Though the real treasure among the extras are the original storyboards that allow you to see the movie coming together in Miyazaki’s hands, there are also three featurettes which let you hear from the man himself, and it’s here that his genuine love for this movie comes through. The animation master hopefully has at least a few more movies left in him, but for now it’s a pure joy to see the mischief in his eyes as he talks about “deceiving” Japanese viewers into thinking that Kokiro was based on an actual European city, whereas it’s clearly just a hodgepodge of classic European settings, rendered as beautifully as an impressionist painting. And, most remarkable of all, producer Toshio Suzuki reveals that he pitched the idea of making a movie about an adolescent girl, and at the time Miyazaki said he knew nothing about them (having only sons.) As anyone who’s seen Kiki’s Delivery Service knows, that didn’t keep him from making a movie that not only captures that awkward period in life perfectly but also delivers a tale that manages to cast a still lingering spell on viewers young and old more than 20 years after its original release.